Police captain Zhang (played by Sun Honglei) partners with a drug lord named Timmy Choi (played by Louis Koo) after he is arrested. To avoid the death penalty, Choi agrees to reveal information about his partners who operate a cocaine ring. Zhang grows suspicious of Choi’s honesty as several police officers began a raid on the drug ring. 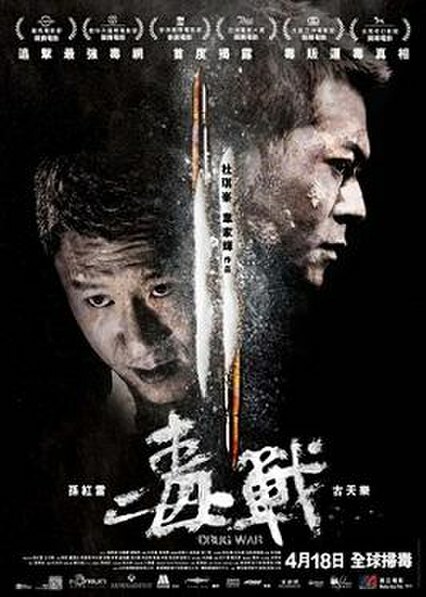 Drug War is a crime film made and released in Mainland China by a Hong Kong film company. Naturally there is going to be an element of political compromise. All the policemen are Mainland Chinese and all the drug dealers are from Hong Kong (Take a guess which side wins in the end). Nationalism in movies has never really bothered me unless it’s oozing with disgustingness (i.e. Michael Bay’s Armageddon). That is not the case here and I don’t have a problem with that. My interest is not the politics, but rather what Johnnie To will bring to drug film set in Mainland China. The answer? Not too much. What’s missing from Drug War are the Johnnie To quirks. The zany off-the-wall characters who have speech impediments and odd ticks are gone. The dramatic noir lighting, minimalistic stage-like blocking or themes of brotherhood are gone. Even the gunplay is less stylized and presented in a realistic fashion. I don’t miss any of these specific quirks or tropes, but without the idiosyncratic Johnnie To stamp, what’s left is a very straightforward police procedural. The characters are servicing the plot, which is odd for a Johnnie To film because usually it’s the other way round. We don’t get insight into the distinct personalities of the drug dealers or police officers and their relationships (like in Election, an ensemble piece where it manages to characterize the supporting characters). We don’t know if they have family members or girlfriends waiting for them at home or any backstory. The story is simply moving beat-by-beat linearly on the central question of how trustworthy Louis Koo’s drug lord character is. There’s nobody you’re supposed to be rooting for, but things are continually changing and you simply watch awaiting the final outcome. To, a director and producer with his own production company, has always been best when he has free reign. The limits of To’s free reign authorship is that he is very culturally rooted to Hong Kong and possesses a firm voice regarding to its politics (Election), economic condition (Life Without Principle), daily life in Hong Kong (the office politics in Needing You), or even local nostalgia (Throwdown, Sparrow). As exemplified in 2008’s Vengeance, a project which was co-financed by French financiers and starred French rock singer Johnny Halliday, To’s directorial voice is weaker when he steps outside of his comfort zone. The three Hong Kong actors casted alongside Johnny Halliday to couch the star for two thirds of Vengeance mirrors the Milkyway regulars who show up as the seven Hong Kong drug bosses in Drug War’s denouement. It’s like he is trying to recalibrate the film by filling it with things he’s familiar with. However, there is no sense of To’s personal perspective on the topic of drug running, drug addiction, crime or how the police work in China through the film’s story, themes or characters. That makes a bit tame because To has fared much better in the past. In context to Johnnie To’s back catalogue, Drug War will be remembered for pushing the boundaries with the Chinese Film Bureau. The Mainland police are shown working undercover and solving crimes, having gun battles with criminals and some even dying in the line of duty; these are all images that were previously not allowed to be shown in a Mainland theatrical release. Yet now we are seeing them onscreen. So that is a proper achievement that’s worth celebrating. The final product is probably more telling of Chinese film censorship than of To’s directorial sensibilities. But I can’t help but think that there is a grittier, nuttier version of Drug War lying in the corner of Johnnie To’s desk that is stamped “rejected”, namely the version of the story that he didn’t get to make.